America’s Sub Shop® is hitting the road and kicking off a year of travel and adventure with the Great American Sub Tour! Featuring regional flavors from destinations across the U.S. in Blimpie restaurants and selecting winners after each “tour stop”. Enter to win one GRAND PRIZE trip for four (4) to a Great American Sub Tour destination of your choice AND other quarterly prizes. All 5 quarterly winners entered into GRAND PRIZE drawing 1/6/20! Eligibility: The Sweepstakes is only open to legal residents of the fifty (50) United States and the District of Columbia (“ Territory”), who have reached 18 years of age or older as of the date of entry. The Sweepstakes is subject to all applicable federal, state and local laws and regulations and is void where prohibited or restricted by law. Employees of, members of the immediate family of, or those domiciled with an employee (whether related or not) of Sponsor (as defined in Section 10), or its parent, affiliates or related companies, and subsidiaries, as well as Blimpie® licensees and franchisees are ineligible to participate in the Sweepstakes. An eligible individual, who enters the Sweepstakes, is hereafter referred to as an “ Entrant” or " you". Participation constitutes Entrant's full and unconditional agreement to these Official Sweepstakes Rules and Sponsor's decisions and interpretations, which are final and binding on all matters related to the Sweepstakes. Winning a prize is contingent upon fulfilling all requirements set forth herein. How to Enter the Sweepstakes: During the Sweepstakes Period (as defined in Section 3), an Entrant may enter the Sweepstakes through the website URL at https://www.blimpie.com/sweepstakes (" Website") by completing and submitting the online registration form in order to receive one (1) entry into the Sweepstakes. The Entrant must complete the registration form, which may include, but is not limited to his/her complete first and last name, email address, date of birth, favorite store zip code and agreement to these Official Sweepstakes Rules (each an " Entry" and collectively " Entries"). All Entries must be complete and accurate to be eligible. All Entries submitted become the property of the Sponsor. Limitations: limit of one (1) Entry per person during the entire Sweepstakes Period (as defined in Section 3). An Entrant, who enters more than once during the Sweepstakes Period, employs any spamming techniques, uses multiple email addresses, or otherwise attempts to enter multiple times in violation of these Official Sweepstakes Rules shall be disqualified from the Sweepstakes. Sweepstakes Period: The Sweepstakes begins at 9:00 A.M. Eastern Standard Time (EST) on Monday, January 7, 2019 and ends at 11:59 P.M. EST on Sunday, December 29, 2019 (" Sweepstakes Period"). The computer clock of the Sponsor (as defined in Section 10) is the official time-keeping device for the Sweepstakes. Sponsor reserves the right to modify, extend, suspend or terminate the Sweepstakes in its sole discretion with or without cause. Prizes, Approximate Retail Value ("ARV") and Odds: All details and other restrictions of the Prizes (as defined herein) not set forth in these Official Sweepstakes Rules will be determined by Sponsor in its sole discretion. There is no substitution, assignment, or cash equivalent for any of the prizes. No substitution, exchange or transfer of prize by any winner. Sponsor reserves the right to substitute any prize for one of equal or greater value. Each winner is responsible for all taxes and fees associated with prize receipt and/or use. Four (4) Blimpie gift card with the retail value of $250.00 each, terms and conditions apply. Four (4) Airline or Gas gift card with the retail value of $100.00 each, terms and conditions apply. Four (4) Blimpie Swag Prize Pack with an approximate retail value of $50.00 each. 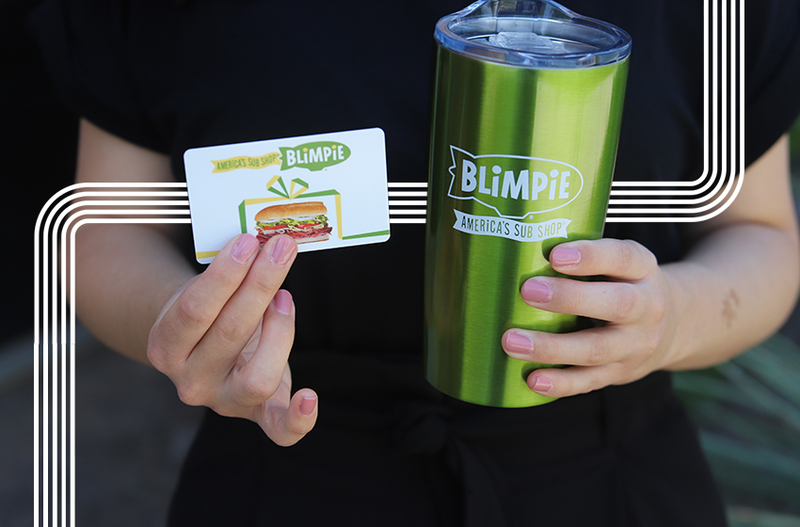 Eight (8) Blimpie gift cards each with a retail value of $25.00 each, terms and conditions apply. Each Prize a "First Prize" and collectively "First Prizes". Total ARV for First Prizes is one thousand eight hundred and 00/100 dollars ($1,800.00). Event tickets for a local experience for four (4) people (collectively the “ Grand Prize”). The ARV of the Grand Prize is four thousand two hundred fifty and 00/100 dollars ($4,250.00). First Prize Winners and the Grand Prize Winner may collectively be referred to as the " Winners". First Prizes and Grand Prize may collectively be referred to as the " Prizes". Total ARV: The total ARV of all prizes available in the Sweepstakes is six thousand fifty and 00/100 dollars ($6,050.00). Any difference between the approximate retail value and the actual retail value will not be awarded or refunded. Odds of Winning: The odds of winning one (1) of the First Prizes depends on the total number of eligible entries received during the Sweepstakes Period. The odds of winning the Grand Prize are approximately one in twenty (1:20) chance. Grand Prize Rules: The First Prize Winners will be entered into a random drawing, for a chance to win the Grand Prize on or about Monday, January 6, 2020. No insurance is provided as part of the Grand Prize, and obtaining any insurance, such as, but not limited to travel insurance, health, accident, or medical insurance, and property loss or damage insurance is the sole responsibility of the Winner and his/her guests. Travel and other arrangements will be determined by Sponsor. Airfare will be round trip (originate from and end at the same major airport close to the Winner's residence as determined by Sponsor, in its sole discretion), coach class from and to an airport selected by Sponsor. Reservations must be made and tickets issued prior to travel. Trip may not be combined with any other offer and travel may not qualify for frequent flyer miles. Changes to reservations are not permitted. Winner and his/her guests must travel together on the same itinerary and are solely responsible for having any required travel-related documents (i.e. valid government-issued photo ID, etc.) prior to departure in order to travel as well as fulfilling any/all travel and security requirements. Winner and his/her guests are responsible for any transportation and expenses not specifically noted in these rules. All federal, state and local taxes and any other costs and expenses associated with prize acceptance and use not listed herein as part of the prize including, without limitation, ground transportation, gas, luggage fees, souvenirs, miscellaneous hotel expenses, meals, incidentals, airline fees, security fees, entertainment, taxes, and gratuities are the sole responsibility of Winner and guest. Winner must contact Sponsor with three (3) preferred travel dates no later than six (6) weeks prior to the first preferred travel date. Winner or a guest must have a credit or debit card to guarantee hotel room at check in. In the event the Grand Prize Winner or guests engages in behavior that (as determined by Sponsor in Sponsor's sole discretion) is inappropriate or threatening, illegal, or that is intended to annoy, abuse, threaten or harass any other person, Sponsor reserves the right to terminate the trip early, in whole or in part, and send the Grand Prize Winner and guests home with no further compensation to winner. Winner must book trip by July 30, 2020. Travel is subject to availability and certain blackout dates may apply including but not limited to Christmas, New Year's or any U.S. public holiday. If Winner and guests cannot comply with these restrictions or any other portion of these Official Sweepstakes Rules, the Grand Prize will be forfeited in its entirety and an alternate winner may be chosen. Tax Information: All income taxes (including, without limitation, federal, state and/or local income taxes) and any other costs and expenses associated with Grand Prize acceptance and use not specified herein as being provided, are the sole responsibility of the applicable Winner. A 1099 tax form (preceded by a W-9 Form) will be issued to the winner of the Grand Prize. Winner Selection Dates: Five (5) First Place Winners will randomly be selected from those eligible Entries received by the dates set forth in the table below, on or about: (1) April 3, 2019, (2) July 2, 2019, (3) October 2, 2019 and (4) December 30, 2019 (individually a " First Prize Winner Selection Date" and collectively " First Prize Winner Selection Dates"). Each First Prize Winner must claim his/her First Prize as set forth below in Section 6. On or about Monday, January 6, 2020 (" Grand Prize Selection Date"), one (1) Grand Prize Winner will be selected in a random drawing from the First Place Winners. Grand Prize Winner must claim his/her Grand Prize as set out below in Section 6. Notification and Claiming Prize: Potential Winners will be contacted by Sponsor on or shortly after each First Prize Winner Selection Date and the Grand Prize Selection Date by phone or email (individual and collectively, " prize notification") and will be required to execute and return via mail or email Sponsor’s affidavit of eligibility/release of liability/publicity release form and any other documentation reasonably requested within three (3) business days of prize notification attempt or prize will be forfeited and an alternate potential winner will be selected. Return of prize notification as undeliverable or unreachable may result in disqualification and alternate selection in Sponsor's sole discretion. The Grand Prize Winner's guests (or Winner, as parent/legal guardian, if guests are a minor and winner's child(ren)) must execute a release of liability/publicity form prior to departure. Grand Prize Winner's guests must be of legal age of majority in his/her jurisdiction of residence, unless a child or legal ward of Grand Prize Winner. The Grand Prize Winner will be required to complete and return an IRS form W-9. Sponsor will work with the Grand Prize Winner and guests to ensure the above required documents are completed and returned timely. If any of the Winners do not comply with these Official Sweepstakes Rules, meet eligibility requirements, do not claim the respective prize within the required timeframe of Sponsor's prize notification or do not timely comply with all of Sponsor’s instructions to claim the respective prize, then Sponsor has the option to select an alternate winner or winners. Sponsor: (a) learns or suspects that Entrant has misappropriated another’s identity, or infringed upon the rights of any person or entity; (b) finds that Entrant has tampered, is tampering or plans to tamper with the entry process or the operation of the Sweepstakes; or (c) believes that Entrant has violated these Official Sweepstakes Rules or is acting in an unprofessional or disruptive manner. Any attempt by any person to undermine the legitimate operation of this Sweepstakes may be in violation of criminal and civil law, and, should such an attempt be made, Sponsor reserves the right to seek damages from any such person to the fullest extent permitted by law. Sponsor's failure to enforce any term of these Official Sweepstakes Rules shall not constitute a waiver of that provision. Except where prohibited, by entering this Sweepstakes, each Entrant hereby grants to Sponsor, its affiliates, and its licensees the right and license to use Entrant’s Entry, name, image, likeness, voice, photograph, statements, biographical information, content and prize status, in whole or in part, for promotional, advertising and/or publicity purposes in any media, now known or later developed and available, throughout the world and in perpetuity, without compensation or notice to, or further consent of, the Entrant, to the extent permitted by law. If any provision of these Official Sweepstakes Rules is found to be unlawful, void or for any reason unenforceable, then that provision shall be deemed severable from these Official Sweepstakes Rules and shall not affect the validity and enforceability of any remaining provisions. Headings and captions are used in these Official Sweepstakes Rules solely for convenience or reference, and shall not be deemed to affect in any manner the meaning or intent of these Official Sweepstakes rules or any provision thereof. Release and Limitations of Liability: Except where prohibited, by participating in the Sweepstakes, each Entrant forever and irrevocably agrees to release, indemnify, defend and hold harmless Sponsor, and related companies, prize partners (if any), Facebook, Twitter, Instagram and each of their respective parent, subsidiaries, affiliates, successors, predecessors, and their respective agents and agencies, and their respective officers, directors, shareholders, employees and agents (collectively, “Released Parties”) from and against any claim, cause of action, loss, fine, award, judgment, demand, lawsuit, obligation, interest, tax, penalty or other damage, including, without limitation, expert fees and costs, arising out of or in connection with Entrant’s participation in the Sweepstakes or receipt or use of any prize, including, but not limited to: (a) unauthorized human intervention in the Sweepstakes; (b) technical errors related to computers, servers, providers, or telephone or network lines; (c) printing errors; (d) errors in the administration of the Sweepstakes or the processing of Entries; or (e) injury or damage to persons or property which may be caused, directly or indirectly, in whole or in part, from Entrant's participation in the Sweepstakes and/or receipt and/or acceptance of a prize. Entrant further agrees that in any cause of action, the Released Parties’ liability will be limited to the cost of entering and participating in the Sweepstakes and in no event shall the Released Parties be liable for attorney’s fees. Entrant waives the right to claim any damages whatsoever, including, but not limited to, punitive, consequential, direct, or indirect damages. If, for any reason, an entrant’s entry is confirmed to have been erroneously deleted, lost, or otherwise destroyed or corrupted, entrant’s sole remedy is another Sweepstakes entry, if it is possible. If the Sweepstakes, or any part of it, is discontinued for any reason, Sponsor, in its sole discretion, may elect to hold a random drawing from among all eligible entries received up to the date of discontinuance for any prize offered herein. No more than the stated number of prizes will be awarded. In the event that production, technical, seeding, programming or any other reasons cause more than the stated number of prizes as set forth herein to be available and/or claimed, Sponsor reserves the right to award only the stated number of prizes by a random drawing among all legitimate, un-awarded, eligible prize claims. Disputes: By entering this Sweepstakes, you agree: (a) to be bound by these Official Sweepstakes Rules and by all applicable laws and decisions of Sponsor, which shall be binding and final; (b) any and all disputes, claims and causes of action arising out of or connected with this Sweepstakes or any prize shall be resolved individually, without resort to any form of class action, and exclusively by the state or federal courts located in Maricopa County, Arizona; (c) any and all claims, judgments and awards shall be limited to actual out-of-pocket costs incurred, including costs associated with entering this Sweepstakes, excluding Entrant’s attorneys' fees, expert fees and costs; and (d) under no circumstances will Entrant be permitted to obtain awards for, and Entrant hereby waives all rights to claim, punitive, incidental, special and consequential damages and any other damages other than actual out-of-pocket expenses, and any and all rights to have damages multiplied or otherwise increased. SOME JURISDICTIONS DO NOT ALLOW THE LIMITATIONS OR EXCLUSION OF LIABILITY FOR INCIDENTAL OR CONSEQUENTIAL DAMAGES, SO THE ABOVE MAY NOT APPLY TO ENTRANT. All issues and questions concerning the construction, validity, interpretation and enforceability of these Official Sweepstakes Rules and the rights and obligations of Entrants and Sponsor in connection with the Sweepstakes shall be governed by and enforced in accordance with the laws of the State of Arizona, without giving effect to any conflict of laws rules (whether of the State of Arizona or any other jurisdiction), which would cause the application of the laws of any jurisdiction other than the State of Arizona. These Official Sweepstakes Rules shall be binding upon and inure to the benefit of Sponsor’s and each Entrant’s respective successors, assigns, estates, executors and heirs. Winners List Request: After January 31, 2020, for a winners list, send a self-addressed stamped envelope (void where prohibited) for receipt, no later than April 30, 2020 to: Blimpie® Great American Sub Tour Sweepstakes Winners List Request, c/o Kahala Management, 9311 E Via De Ventura, Scottsdale, Arizona 85258. Winners List will contain first name, last initial and state of winner.